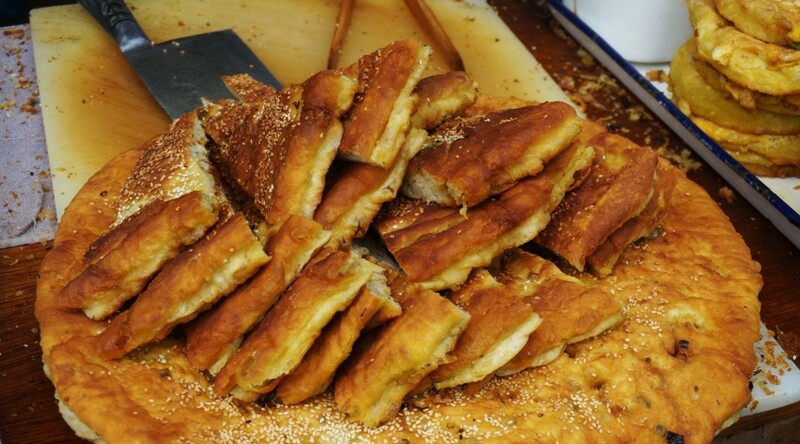 Commonly sold in wet markets or on the street throughout the day, qiāng bǐng (Chinese: 羌饼) is a thick, savory bread that is fried in a shallow, round pan. Its dough is chewy and slightly crisp on the outside with fragrant and nutty flavors from the minced scallions and sesame seeds. The thickness of the qiang bing can also vary from stand to stand. It is typically served by slice for about 1.5 yuan. The dough is made with flour, yeast, water, and salt. It is fried in oil and sprinkled with minced scallions and sesame seeds. A heated, shallow round pan is filled with oil and the dough is cooked on one side. The dough is pushed down to be immersed into the oil and slightly pierced to cook evenly, then flipped. Once the crust is golden on both sides, the bread is removed from the pan, sprinkled with minced scallions then left to cool before served. A mixture of flour, yeast, warm water, and salt are combined and then set aside under a damp towel to rest and rise. After the dough has expanded, flour is sprinkled onto a flat surface and the dough is rolled out and shaped into a large circle. The dough is brushed with oil and sprinkled with sesame seeds. A heated, shallow round pan is filled with oil and the dough is cooked on one side. The dough is pushed down to be immersed into the oil and slightly pierced to cook evenly, then flipped. Once the crust is golden on both sides, the bread is removed from the pan, sprinkled with minced scallions then left to cool before served. The word “Qiang” from qiang bing comes from the Chinese minority, Qiang’zu, from the Tibetan and Sichuan Provinces. Their existence is slowly declining due to its lack of popularity among locals, which can most likely be explained by people’s preference to thinner crepe-like bings that are made fresh.